One problem many of us face is tool organization. It takes so many tools to get the job done right, that sometimes they are hard to keep track of. One of the reasons for disorganization could be because of using your "work" tools at home, or using the same tools to go from building in your shop, to installing on the jobsite. If you are not completely organized, you could leave an important tool behind, which could be very costly. I would like to introduce Sortimo, a 40 year old European company that makes just about everything you would need for the ultimate in tool organization. They just recently made there way over to the US, to hopefully bring organization to America. What I like about Sortimo is they offer a complete solution to storage and organization for both the home/business, as well as storage solutions for vehicles of all types. The recent addition of their L-BOXX (similar to the Festool Systainer) has added another solution that can be used at home, transported with their vehicles storage system, and used on the job. 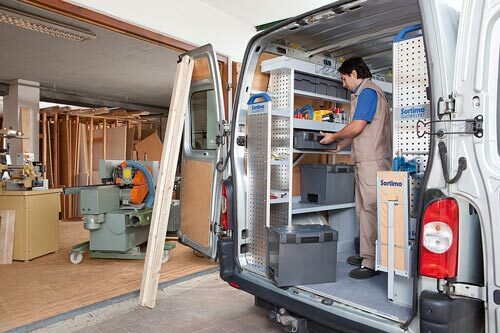 Sortimo has also partnered with Ford to offer the Sortimo storage system to the latest Ford Transit Connect Van.